Yeah! two finished objects in one week. 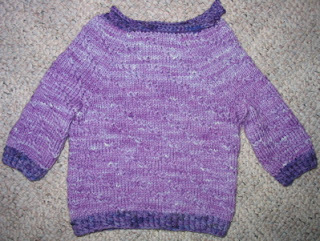 This is a raglan baby sweater. I dyed the yarn myself. The stitch pattern is the same as the socks from the previous post, the pattern itself was made up as I went along. I still need a button for the collar. There's probably one in the stash. The next baby knit is on the needles, yellow this time. I'm waiting for the next Sock Madness pattern to see if I want to cast on pattern 4 or skip that one for now and do pattern 5 with the rest of the pack. 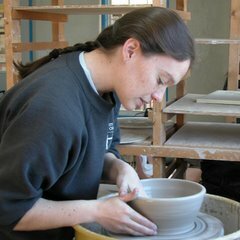 For tonight though I made too many pots and my fingers are tired, no knitting for me. I thought I had a good belly shot to post, but my husband took a batch of really bad pictures the other day. Maybe later. By the way, I almost squeeeeed out loud when I heard Lime and Violet mention your hand dyed yarns on the last podcast. :) Awesome!